Black N Bianco Boys' Signature Sateen Dress Shirt in Gray. 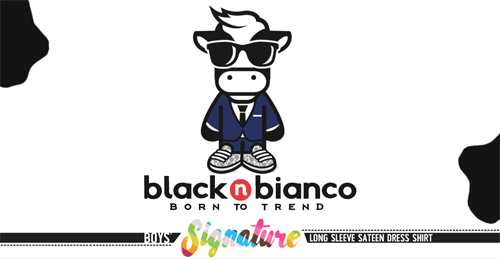 Our boys signature sateen long sleeve grey dress shirts were specially designed and made for kids. Our sateen cotton fabric has a lustrous surface creating a very soft, smooth and luxurious touch when worn against the skin. The buttons feature silver trims on side adding an extra layer of style and personality. A classic dress shirt with a modern flair.